hairbowswonderworld: NUTFIELD WEAVER - Perfect uniqueness! Planning for a dream wedding and want something unique? You must visit this etsy shop of Nutfield Weaver . Be prepared to be blown away with her creation, simple as beauty itself and at the same time so classy and elegant ! 'Handmade' has become really trendy recently as we learnt to appreciate all the labour, creativeness , heart and soul of the crafter/artist put in his/her creation. Nutfield Weavers creations are handmade deep down to the core! She handweaves all the yardage lace to make her things from a ringsbearer pillows or flower girl baskets to a tissue holder and so on. Yes! No eletricity or computer program involved but totally handwoven with her 8-harness LeClerc floor loom. Her beautiful light weigh handwoven lace are woven with all-natural fiber. 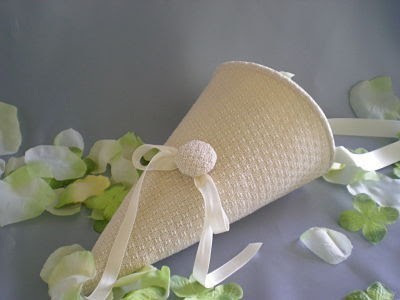 Look at this beautiful handwoven ivory lace petal cone! I just love it! What an unique alternative to a traditional flower girl basket. And after the wedding, fill it with potpourri or silk flower petals so it can beautify your bedroom or your dresser. Priced at $30, this is really an awesome deal. And to match with it, nothing can be better than this ring bearer pillow. Simple, subtle and elegant. If I were you I would get it now at $25 before the seller raising her price as I guess she might do it, imagining all of the time and work she must have put in it. 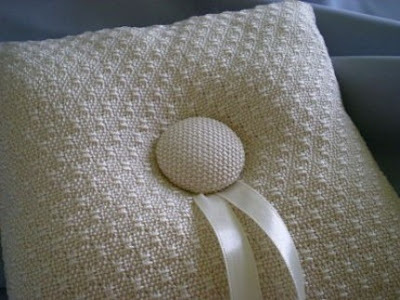 And here is another beautiful wedding related item from Nutfield Weaver. I think I should not say anything as the picture says for itself. This Handwoven and crocheted lace wedding garter is just as unique as how pretty it is. So, yes, I say, come to her Etsy store and explore more what she has to offer! You will find more beautiful wedding items as well as a wide range of items for your home, holiday or an anniversary! 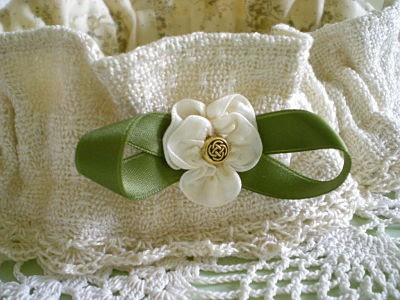 Wow, your Handwoven and crocheted lace wedding garter is so amazing.